Cheesie's Pub & Grub, 958 W. Belmont reported that a one-armed homeless man was making threats. Police officers defused the situation. A 911 caller reported that the aforementioned one-armed homeless man was refusing to leave the parking lot behind 958 W. Belmont. The man was not cooperative this time and officers took him into custody for trespassing. Case #HW438879. 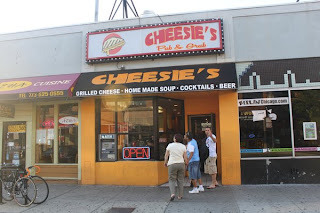 Cheesie's Pub & Grill called 911 because a one-armed man who is not allowed on the premises had returned. The gentleman involved in these matters is said to go by the name "Babalu." In matter involving a different man, officers made contact with "PD" near Belmont and Wilton. A records check indicates that California has a full extradition warrant out on PD for a drug charge. PD was taken into custody while officers sort through the warrant matter.